But before that let me show my ingredients that I received from my partner Alicia. I was so happy to see the amethyst stone. Now this will give me an opportunity to practice the wire wrapping that I am trying to accomplish. This was my first attempt for this kind of work. In the beginning I used just a silver chain for this necklace...nah it did not quite do it. Then a few pearls and stones with wire work...still it did not look quite right on me. So I used the amethyst stone chips she sent me and added some more from my stash. It looked right. At least to me. and then headed to a baby shower party Saturday morning. Yes, some people did notice and were kind enough to shower me with compliments. I am so anxious to see what Alicia made with the packet that I sent to her. She is a very creative jewelry artist. 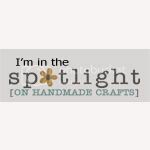 You may find her blog and shop here. 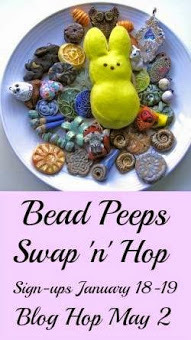 And please be sure to check all the other members who took part in this Bead soup party. My heartfelt thanks to Lori Anderson who hosted this party. It was a lot of work for you,Lori, a big THANK YOU for all that you have done behind the stage and those email reminders you sent to keep us on track. What an incredible focal you got! It is stunning. And the wire work on it is just the way to go. I love it. Your necklace is beautiful! Great job for a "1st" attempt..Wow! The wire wrapping on the necklace is gorgeous! You did that stone proud! That is a focal! You did wonderfully! Love how you bulked up strand with the chips. This is your first try at wirework? Holy smokes! Beautiful!! What a beautiful focal! I love your final product. Your set is so beautiful, I like the way you worked with the centerpiece. Your necklace and earrings are just gorgeous!!! 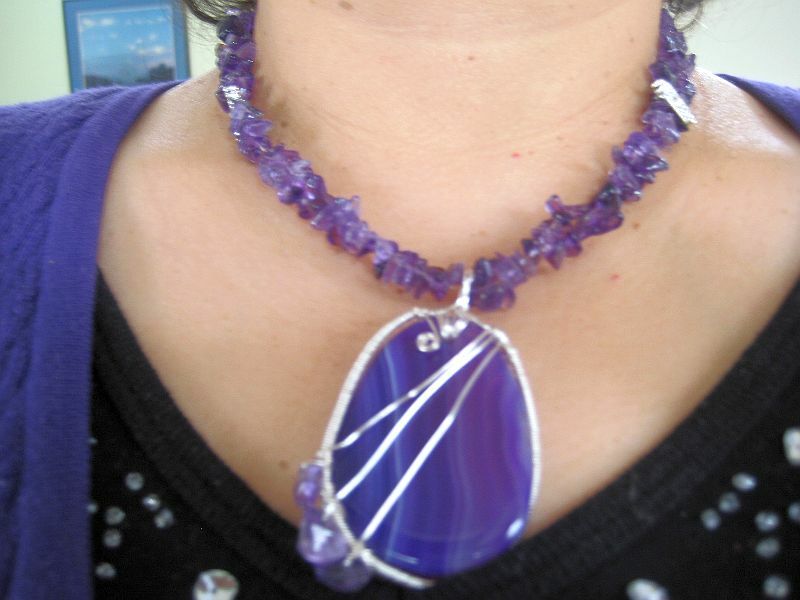 I love the heavyness of the necklace, and your wirework is wonderful! Beautiful! Love the colors and what a stunning focal! That focal is stunning! You did a great job balancing the size of it. Love the matching earrings. Great job! Thank you all for your kind words. I am blog hopping and soon will reach at your place. Take care. Dita. Nice job with that pretty focal bead and wire wrapping. Have fun hopping around today. Wow - beautiful work! I see a lot of wire wrapping in your future! what an amazing focal! You have done such a great job with it, and your wirework is lovely and neat. You showcased that focal stunningly! Amazing "1st attempt"...the color is beautiful and the focal is simply stunning! Yummy! Splendid job with that amethyst! 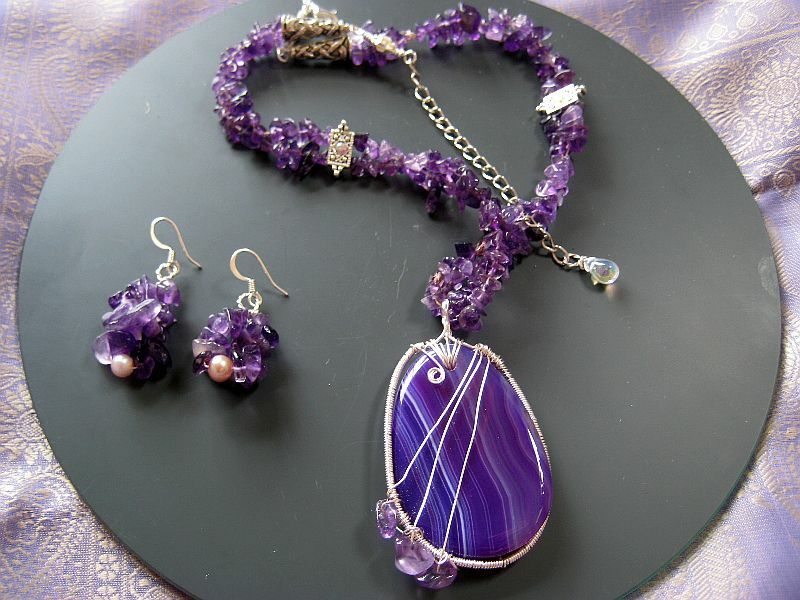 Loving the amethyst stones - they are a perfect match to the beautiful focal! That focal is stunning and you really made it stand out. Love the purple! nice job on the wire wrapping! love the pieces...purple is one of my favorite colors! Beautiful necklace and earrings. 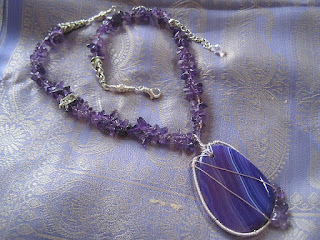 I think using the amethyst chips instead of chain was a great idea - added balance to that big focal. Great work! Great job with the wire wrapping. The necklace is gorgeous. What a fantastic focal piece. Your wire work is great. I love that you added hips to the design. This will be a fun necklace to wear! You did an amazing job with such a large focal, it came out perfect. Wish I'm comfortable with wire working like you - the wrap is wonderful! Wonderful design! For a first attempt that's awesome! I'm so glad you tried a new technique for the party, and I hope you'll join me again this summer! Beautiful necklace! Adding colour and "fullness" by using chips instead of a chain was a really good idea. Looks great! I love the "chai" you maid with those chips. It really adds dimension and wow factor. Cool job on the wire-wrapping, too! LOVE that you took a picture of this piece on so we could see just how it wears!! It is truly fantastic - a definite statement piece! Great job on your wirwork! It gave the pendant quite a bit of pizazz. What a necklace! That stone looks great with your wire work - you showed it of beautifully. By the way, I've nominated Lori for the Force of Good Awards, please stop by my blog at creatingcures.blogspot.com and read a short post. Beautiful work!! I love the purple tones and the amazing pendant that you made with the amethyst stone! What a great job!! Love the purple tones and the amazing pendant you made!! Great job on the wire wrapping! Beautiful! You did a fantastic job with the wirework!! I love all the purple. And your wire wrapping is amazing! Great job putting it all together! For so much amethyst, it is not over the top at all. Love it! Beautiful wirework - doesn't look like the 1st time at all! Well done for making such a striking necklace. Beautiful!! Oh wow. Your wirework is fantastic. Beautiful necklace! Great work with the focal.The colors also have come out so beautifully. I love your use of the wire on that stunning focal! Beautiful necklace....really great! I can see why you got showered with complements when you wore it! Love the purples! Great job with the wire work! Notice? How could they miss it - its gorgeous. Love that purple stone. And I love the chips with it - something about the large stone and little chips dicotomy. Just works for me. Great job! Love it! I can't believe that was your 1st wire wrapping attempt. Nice job! Your necklace came out beautifully! WOW. That is some gorgeous wire wrapping. And I think it was a good choice going with the bead chips- they do your focal proud. WOW! I love purple. This is a great set. Very pretty! you are right - that focal is BIG but gorgeous! What a super lovely necklace! For a "1st" attempt, you really did great! Your wirework looks great! Oh wow! This is gorgeous!! You did an awesome job. Woaah!! This colour is just my favourite!! It's beautiful, and I like the wiring. Great job!!! You did a fabulous job on wire wrapping your focal.